If you’re in a place of insecurity, wondering how to handle a challenging task, remember three things. In the Christian life, prayer is essential. Prayer demonstrates our dependence on God. It reminds us that we’re not in control of our life and there is One who deserves all glory and praise. Prayer lifts our eyes off of ourselves and reminds us of our heavenly hope. So how do we as busy moms find time to pray? Where do we carve out time to spend in conversation with the Lord when there is always someone (or something) needing our attention? The dinner table has a way of breaking down barriers between people. As we sip our coffee and eat our pie, we share about life and faith in Christ. Our hope does not lie in ourselves or our performance. We cannot gain God’s blessing through obeying his commands, and we can’t do enough good deeds to earn forgiveness for even the smallest sin. As mothers, we can be tempted to find our righteousness in giving our children the picture-perfect childhood, filled with super-food meals and the best education possible. Somehow we falsely believe that if we can be the ideal Proverbs 31 wife and mother, we will earn favor with God. Yet our hope is solely in what Christ has already done, what he accomplished for us on the cross. God rejoices in sea creatures and rare flowers that no one but him will ever see. He delights even more in children who serve him gladly in unseen ways. Stacy’s life, marriage, ministry, and upcoming ministry projects. Where Christians should look for help during times of difficulty and suffering. How the character of God helps Christians grow. Stacy’s favorite chapters in the book. How Christians should respond when tempted to shift blame when things don’t go the way we want. How to love and minister to difficult people. How discontentment points to deeper heart issues. How Christians can fight fear with truth from the Word of God. How understanding the promises of God help Christians grow in their walk with God. 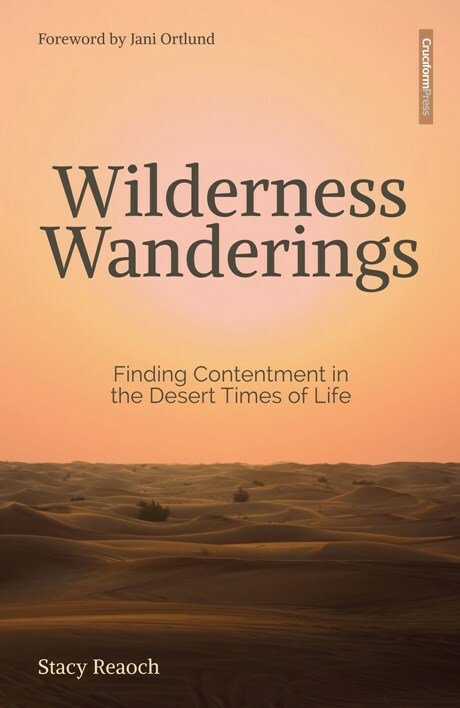 Difficulty and suffering fill our lives, yet our hope and joy is found by looking to Jesus for our contentment, rather than ideal circumstances. I pray that my writing will point others to find their satisfaction in Christ instead of whatever else they think might fill that void. Our children’s growing independence should not lead us to fear, but to trust. Even when our kids step out of our reach, they never step out of God’s. An interview I did with Servants of Grace on some of the most influential books in my life. What if we used whatever influence we have—whether over the crowd to whom we’re speaking or over the “followers” at our kitchen table—to point to the only One who can rescue and redeem? Our righteousness and rest do not come from providing our children with the most nutritious meals or the best education. They come from Christ. As I enter into laughter and joy with my kids, I trust God will provide more opportunities to speak of His love and delight in them (Isaiah 62:4-5). The joy I experience with my children is only a tiny taste of the joy we have in Christ. The best place to go after a breakup is not Netflix or cookie dough, but the word of God. Suffering tempts us to throw pity parties as we navel gaze. But Jesus calls us to love others in our hurt. They say cleaning your house with young children is like brushing your teeth while eating Oreos. The moment I finish cleaning the living room, I hear a crash in the bedroom that tells me a stack of puzzles has just been emptied on the floor. In the midst of all the mundane tasks—emptying the dishwasher, tackling the laundry piles, filling the cereal bowls—it’s easy to lose sight of God’s greater purpose. Church communities look different for every group of believers. But what never changes is our desperate need for one another. In our efforts to encourage discipleship in the local church, be open to different ways God might choose to influence you. How Much Do You Love Chocolate? God filled the world with good things. Satan would love to use them to keep you from joy in Jesus. Don’t rob God’s gift of their real joy in him.